Thanks everyone for the lovely response to Natalie's book! I also really enjoyed getting to know more about one of my favourite stitchery designers. 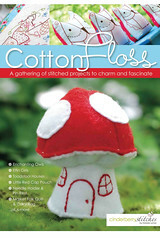 For those of you who asked, Natalie shared that her book has indeed arrived in North America and will be sold in quilt shops - so if you are not lucky enough to win one on the tour, please check this list for a brick and mortar or online store (in the U.S., Canada and UK) that can satisfy your craving for Cotton Floss. So, who won't have to check the list? It's lucky number 113 who'll receive an autographed copy of Cotton Floss. Found your blog through QH. Also from BC I had to check it out and wow you interviewed my fave designer! Can't wait to hear more from you and see Nat's book. Am presently stitching & quilting Tail Feathers! Embroidery is great for working on out on the deck in the summer! 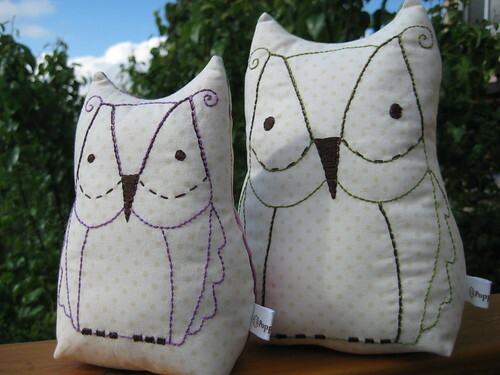 And, whoooooo is the lucky winner of the adorable hooters Henry and Stella? Congratulations ladies. You'll receive an email from me shortly, but if you see this first, drop me a line with your postal address. As Denise knows, there is a national postal strike on in Canada at the moment, so your prizes will be delayed as I will hold off mailing them until reliable service resumes. I'll be back tomorrow with a Baby Announcement!!! Congratulations! Enjoy your wonderful new book. Can't wait to see your new Baby!! It's going to be cute...just know it! !